What’s the difference between an ocean view and a Salt Water Events experience? For starters, we give you access to a wide range of venues in and around Boston Harbor, each magnificent in its own right. And we match your location with extraordinary culinary adventures, entertainment, and all the little extras to make your celebration a resounding success. When compromise is not an option, trust us to be your event planning guide—and inspiration. Where else can you host your event on a magnificent yacht, a secluded island or in a naval history museum? With Salt Water Events, these are only a few of the possibilities. Through our partnership with Boston Harbor Cruises, we give you access to a wide variety of unique venues from historic colonial Boston to the sandy beaches, forts and lighthouses of the Harbor Islands. Not to mention a fleet of well appointed vessels that can accommodate up to 200 guests. The Majesty is Boston's premiere charter vessel. 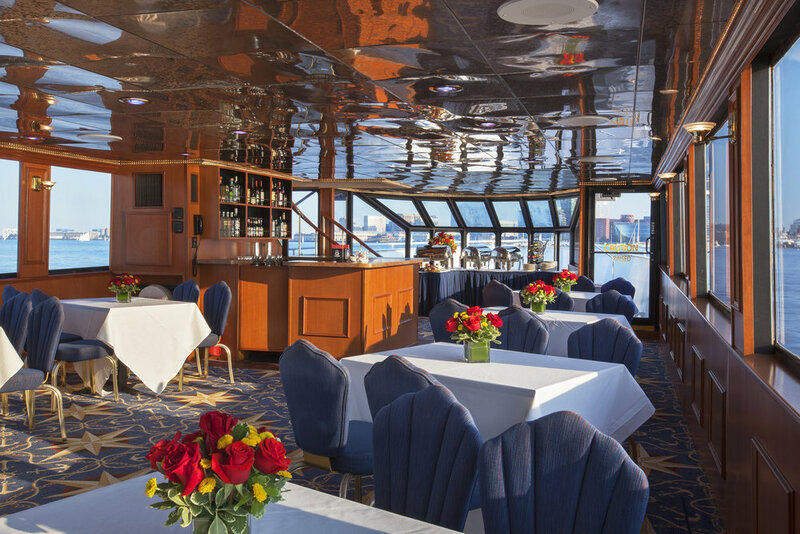 Her spacious atrium and three decks accommodate up to 230 cocktail guests and 185 for a sit-down dinner. Chic and yacht-like, Majesty is a unique venue for a truly memorable event. The Rendezvous offers a modern, upscale yachting experience that is equal parts chic elegance and upbeat fun. From a gorgeously appointed bar area on her second deck to an outdoor patio at the stern, she feels like a hip seaside club. This year we’ve added a breathtaking observation deck Rendezvous is ideal for groups of 75 to 140 guests. The Majestic’s intimate, nautical style is perfect for groups of 40 (for seated dinner) to 80 (for reception style dining). 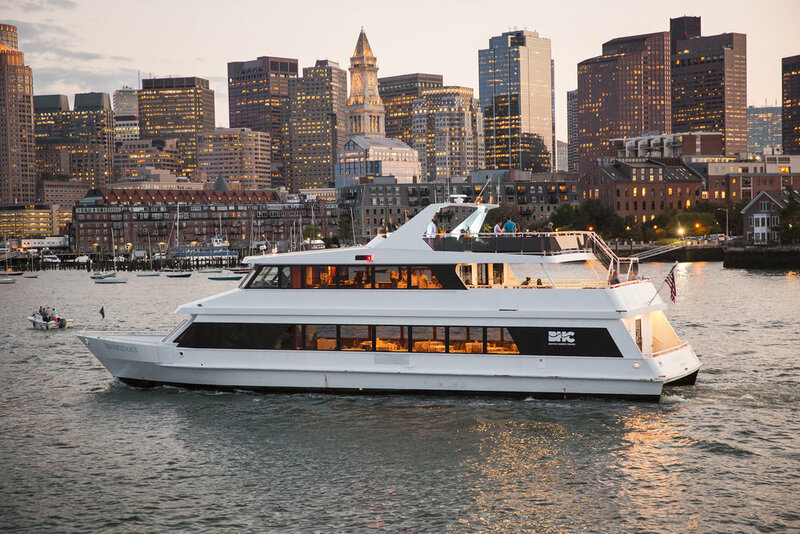 Everywhere you look on this lovely vessel are visual elements inspired by the sea, and her generous outdoor viewing areas including a comfortable patio deck at the stern, and sweeping views from the bow will make for an unforgettable event on the harbor. Whether it's a social gathering, a corporate networking event, or a special celebration, Majestic provides just the right mood and atmosphere. Spectacle Island is just a 20minute boat ride from downtown Boston, but feels like a world away. Host an afternoon or evening event under the cover of a spacious tent. From the pier to picnic tables under a spacious tent, fire pits on the beach to panoramic views of Boston’s city skyline, the world is your oyster. George's Island, home of historic Fort Warren, a Civil War era fort known for its graceful granite archways, is a 45-minute boat ride from downtown Boston. Enjoy lawn games by the beach before sitting down to a seasonal feast with views of the surrounding islands and Boston Light. Peddocks Island, a 50-min boat ride from downtown Boston, is one of the largest Islands on the harbor. It features a World War II-era Chapel, hiking trails, scenic viewpoints, and historic Fort Andrews. Founded in 1986, Harpoon Brewery was on the forefront of the craft beer movement in the US. The Boston Beer Hall, located on the Boston waterfront, has been a favorite place to enjoy their delicious craft beers and ciders since it opened in 2013. We are proud to be a preferred catering partner for the private and semi-private event spaces at Harpoon’s Boston Beer Hall. Please click here for more information on private events at Harpoon. Just steps away from “Old Ironsides” in the historic Charleston Navy Yard, The USS Constitution Museum is a memorable and uniquely historic setting for any social or business event. Enjoy Salt Water Events menus, as a preferred catering partner, in any of the museum’s three dynamic private spaces. Please click here to learn more about planning an event at the USS Constitution Museum. Let us know where you’re celebrating and we’ll bring the party to you! Salt Water Events is available to cater the venue of your choice. Chef Barbara Lynch’s inspired menus are about celebrating local ingredients—and making your celebration an experience to remember. From hors d’oeuvres through dessert, she’ll surprise, delight and satisfy your guests. Whether your celebration calls for an elegant sit-down meal or a casual gathering on the beach, we’ll create a menu to exceed your expectations. Designed by Chef Barbara and expertly prepared, every food experience is unique – from an authentic New England clambake to a beer garden with skyline views. Or, perhaps, you were envisioning an upscale buffet under a dome of stars. If you can imagine it, we’re here to make it a reality. These menus are representative of our seasonal offerings. 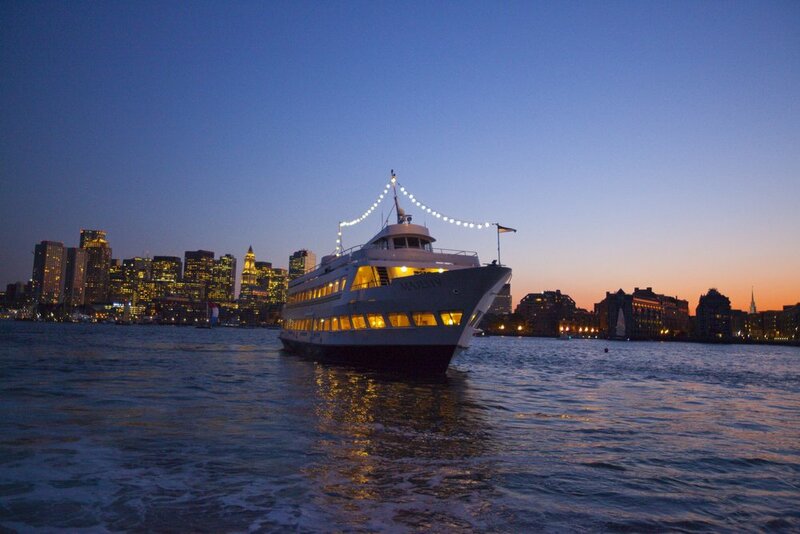 Please contact charters@bostonharborcruises.com for more menus and information on off-site venue catering. Thank you! We have received your inquiry and will respond soon.